North Conway, NH – June 1, 2017– The non-profit Mount Washington Observatory has announced a full line-up of summer educational offerings on the summit of Mount Washington and in the valley including overnight Edutrips and workshops. Back by popular demand the Observatory will be offering five overnight Edutrips including expert instruction on various topics and the opportunity to stay the night on the summit of Mount Washington with Observatory staff. Edutrip dates and topics include: July 8-9 and August 12-13 – Life, Work and the Environment Atop Mount Washington; July 15-16 and August 19-20 – Thunderstorms; October 7-8 – Fall Foliage Photography. Trips will cost $399 to Observatory members and $475 to non-members. Returning for summer 2017 the Observatory will also offer two popular workshops. The Star Party Astronomy Workshop: Presented by John Gianforte, Astronomy lecturer for the Physics Department at U.N.H., this will be a fun and educational outing for anyone interested in astronomy from novice to advanced. The Star Party Astronomy workshop will take place on Saturday, August 5 (“Cloud” Date – Sunday, August 6). This will be a two part program starting with an indoor session at the Weather Discovery Center from 2:30 pm-5:30 pm followed by an outdoor session from 7:30 pm-11:00 pm. The Geology and White Mountains Workshop: Presented by geologist Woody Thompson of the Maine Geological Survey, this will explore the glacial geology of the northern White Mountain region and the history of geological exploration and understanding of the area. The workshop will begin with an informal classroom presentation and then proceed to sites of geological interest in the northern White Mountains region. Taking place on Saturday, September 9, 2017 (rain date: Sunday, September 10). The workshop run from 8:30 am-4:30 pm, starting at the Mount Washington Observatory Weather Discovery Center in North Conway, NH. Workshop fees are $75 for observatory members and $105 for non-members. The fee includes instruction and all associated materials. In the summer months the Mount Washington Observatory provides additional educational offerings including a free Science in the Mountains lecture series, summit weather station tours for observatory members and daily “Live from the Rockpile” call-ins to the summit observers from the Weather Discovery Center. Guests can also explore the world of weather at the Mount Washington Observatory’s two museums – The Weather Discovery Center located in North Conway and Extreme Mount Washington located on the summit of Mount Washington in the Sherman Adams State Park building. For more information on the Mount Washington Observatory educational programs visit MountWashington.org or call (603) 356-2137, ext. 225. Mount Washington Observatory is a private, nonprofit, member-supported institution with a mission to advance understanding of the natural systems that create the Earth’s weather and climate. Since 1932, the Observatory has been monitoring the elements from its weather station on the summit of Mount Washington, using this unique site for scientific research and educational outreach. For more information, call (800) 706-0432 or visit MountWashington.org. Family Friendly, Summertime Fun in MWV! North Conway, NH- This summer, Cranmore is launching an all new Summer Mountain Adventure Park Season Pass. For the low price of $99 per person, the pass will give holders unlimited access to the Mountain Adventure Park all summer long (does not include access to the Aerial Adventure Park or Segway Tours). The Mountain Adventure Park offers a full day of outdoor activities, including the Mountain Coaster, Soaring Eagle Zipline, Giant Swing, Bouncy Houses, Summer Tubing, Bungy Trampoline, Scenic Chairlift rides and more. 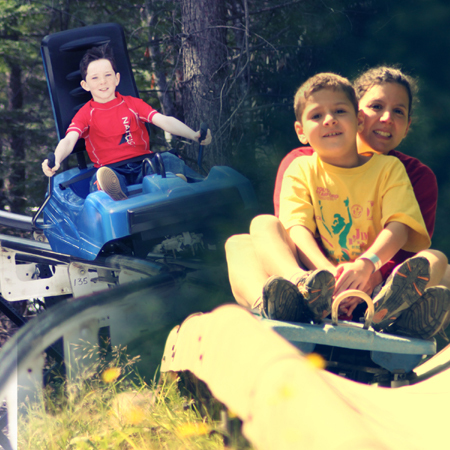 New for summer 2013, Cranmore is also introducing affordable family friendly pricing where children 38” and under are free to the Mountain Adventure Park. In addition, Cranmore has also lowered its Aerial Adventure pricing for participants between 48”and 59” tall. This height group will now be able to enjoy up to two hours of for just $35 vs. $45 last year. Adult pricing will remain at $45 for up to two hours of use. All inclusive Mountain Adventure Park ticket options start as low as $29 for 38”-53” and $39 for individuals 54” and up. Discounts are available for groups of 20 or more. The Summer Mountain Adventure Park Season Pass, along with all other ticket options, are available for sale through Cranmore’s online store at http://www.cranmore.com, by visiting the ticket office during operating hours, or by dialing 1-800-SUN-N-SKI. Cranmore Mountain and Aerial Adventure Parks are currently open weekends to June 16th from 10am-5pm, will go daily June 22nd to September 2nd from 10am-6pm; then back to weekends only September 7th though Columbus Day, October 14th from 10am-5pm. Attitash Mountain Resort has long been recognized as New England’s original summer fun ski area. The Alpine Slide, still the longest in North America, first opened to the public in 1976. Since then Attitash Mountain Resort has added many more summer attractions including the Mount Washington Valley’s longest mountain coaster. This season, Attitash will introduce two more attractions, a freefall Airbag Jump and Slacklines. “We are thrilled to be adding new attractions this year including New Hampshire’s first freefall Airbag Jump and Slacklines, which have become a very popular activity. These added attractions will keep Attitash high on the to-do list for families vacationing in the region this spring, summer and fall,” said General Manager John Lowell. The new Airbag Jump will provide a soft landing for thrill seekers. Similar to what you may have seen used for movie stunts, visitors this season will be able to make a freefall jump from as high as a three-story building into the giant airbag. Slacklines are the latest dynamic sport and freestyle activity to be gaining popularity. Balancing a few feet off the ground on a 2” wide ribbon of nylon stretched tight a length of 30 feet will be the challenge. Tricks like walking backwards, turning, dropping a knee or bounce walking will be fun to try. Also unique to Attitash Mountain Resort, lift-serviced downhill mountain biking opens Memorial Day Weekend on a network of 27 designated trails that Attitash has continued to develop and maintain for summer & fall mountain bike use. Also new this year, the Dirt Trax bike shop has added new, high-end downhill demo bikes to its available rental fleet of mountain bikes. Attitash has over 20 miles of mountain bike trails including the more difficult and technically challenging lift-serviced downhill trails and 8 cross-country trails more suited to all abilities including those just beginning to discover mountain biking as a recreational activity. The Nor’Easter Mountain Coaster, Alpine Slide, Mountain Biking, Eurobungy Trampoline, 24-foot Climbing Wall, Airbag Jump, and Slacklines are all scheduled to open, as weather permits, for weekends only (including the Memorial Day Monday) at reduced admission rates beginning Saturday, May 25. Daily operations start Saturday, June 15 at regular admission rates, when the Waterslides, Buddy Bear’s Playpool, Scenic Chair Sky Ride, Horseback Riding and hand-led Pony Rides along the Saco River become available. Summer season passes are now on sale and begin as low as $100 for children under 48” or for the mountain biking only pass. Mountainside lodging is available at the Attitash Grand Summit Hotel featuring quality accommodations, year-round heated outdoor pool and spas, fitness center and casual dining at Crawford’s Pub and Grill. All rates and information can be found online at attitash.com or by calling 1-800-223-7669. 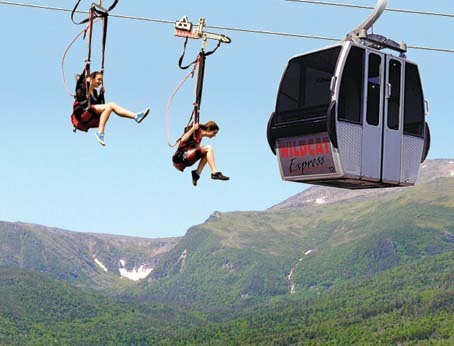 Wildcat Mountain opens for summer beginning Saturday, May 25 at 10 a.m. offering two major state attractions for the long Memorial Day Weekend including New Hampshire’s only ZipRider zip-line cable ride and the highest scenic gondola in the state, the Wildcat Express. Located in the White Mountain National Forest, Wildcat Mountain provides one-of-a-kind opportunities to enjoy views and scenery in Pinkham Notch. Wildcat Mountain’s ZipRider offers a unique flying experience and is the only attraction of its kind in New Hampshire. Different from the canopy zip-line tours familiar to most, at Wildcat Mountain, for just the cost of a $20 ticket and meeting minimum and maximum weight/height requirements, riders will descend just under a half-mile over trails, tree-tops, and the Peabody River at heights of up to 70 feet and speeds that can reach 45 miles per hour. Also unique to Wildcat Mountain, and the only one of its kind in North America, the Wildcat Express has once again transformed from New Hampshire’s fastest and most powerful summit quad chairlift during the winter and spring skiing and riding season to the state’s highest summer and fall scenic gondola. The enclosed 4-person scenic gondola cabins transport guests to the 4,000 foot-plus summit of Wildcat Mountain offering ideal views of Mt. Washington and the Presidential Range. The scenic gondola is the best way for the entire family, including well-behaved canine members on a leash, to enjoy incredible views and scenery. Gondolas run continuously, so you don’t wait in any lines. This summer also marks 80 years from when the Civilian Conservation Corps, armed with axes and cross-cut saws, started clearing the Wildcat Trail in 1933. It was one of the first ski racing trails built in the United States designed by Charley Proctor, the all-around ski champion of Canada in 1927, and was designated as a class “A” racing trail. Wildcat Mountain is planning to celebrate the 80th Anniversary of the Wildcat Trail on Saturday, August 24 with a day of guided hikes, tours, presentations, BBQ, music, and more. The ZipRider & scenic gondola will be open as weather permits for weekends only (including the Memorial Day Monday) beginning Saturday, May 25 and then will begin to operate daily Saturday, June 15 through Labor Day and will the return to weekend only operations from September 7 to October 14. Wildcat Mountain offers hiking, a fishing pond, a lift-serviced 9-hole alpine disc golf course, and weekly guided tours and outdoor interpretive programs with the Tin Mountain Conservation Center and Appalachian Mountain Club. The base lodge café serves a lunch menu and picnic-style “Lunch & Ride” packages are available for individuals, families, or groups. All rates and information can be found online at skiwildcat.com or by calling 1-888-SKI-WILD.